You know we try not to blow our own trumpet. But when we’ve spent so much time and effort and even hired one of UAE’s very best interior designers, to create just the most incredible environment for you to relax, refresh and renew in – we can barely hold back from singing and shouting about it! Recently, I had the opportunity to try a manicure treatment at The Nail Spa in one of their ten locations across Dubai and Abu Dhabi.This boutique spa offers positive energy, a tension eliminatingatmosphere and pristine services with a warm smile. As an Interior Designer, the idea of a symmetrically aligned and meticulously organized spa is something we only see in design concepts. At The Nail Spa, however, the design was flawlessly executed and brought to life. The mood of the spa is so inviting, and the interior crisp and clean, that you can’t help notice the contemporary, sophisticated, and refined design style. Well – lit acrylic shelves display ing exclusive spa products welcome you at the Reception area. 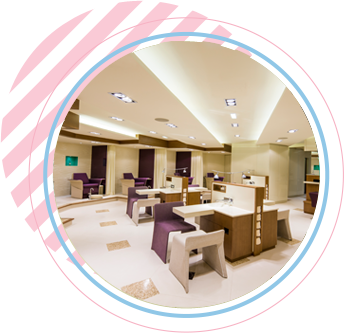 The Nail Spa interior displays a mix of mediums with wooden trim at the top of the walls, funky nail polish holders that spa n from the ceiling to the floor, and colorful towel blocks that provide visual stimulation. This is further complimented by proportionally placed focal points of interest where the eye leads from stations of wavy acrylic panels to bold statements of vivid glass chrome walls in a rich deep hue of violet. 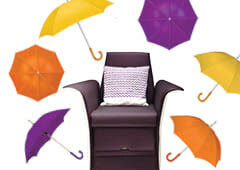 Modern seating arrangements and ample service stations entertain and soak tired feet in atension releasing foot soak. A well planned minimalistic layout, keeping flow in mind, is one reason why the spa managed to look picture – perfect able to accommodate large amounts of circulation without disrupting the tranquility. Spa rooms offered calming privacy with perfect ambiance for relaxation and one of my favorite features was the starry night illusion on the ceiling created using optical fibers. One distinguishing factor was the temperature of the spa was comfortable for clients with their feet in water or enjoying other spa treatments. I am fascinated by the proprietor’s ability to maintain exceptionally high standards of perfection, all in style. Needless to say, I’ll be returning again to this slice of heaven soon.